Need to Schedule a Service Appointment? Routine maintenance keeps equipment running in top condition, whether you're working or playing. Tractor downtime can be costly and mean lost opportunity. And we know there's not much worse than a great weekend with fresh snow...and a snowmobile that won't run. 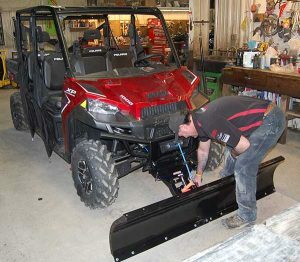 Our experienced and trained staff offers you year-round service on your Massey Ferguson and Case IH tractors, as well as your Polaris snowmobiles and all your Stihl equipment. We promise you quality work at reasonable prices. Our service department is open M-F from 8:30 a.m. to 5 p.m, and 8 a.m. to noon on Saturdays (for drop-offs only.) Appointments are not required, but are recommended. Contact us anytime for preventive maintenance or needed repairs. Use the form on this page to request an appointment or ask a question. Our techs stay up to date on all our product lines, new models, and current technology. We're here to serve you!